There is a rapidly increasing number of Cloud-Providers. You have to decide which fits best. Otherwise your data will be spread over the world and its hard to find out where they are. I checked free accounts of 12 providers and their usability on Apple’s iOS-Devices as well as their PC-Client versions since more than one year. This article describes my experiences with all the free offers. available context menu on the Mac/PC icon with all necessary functions for accessing local sync folders, preferences, recently updated files, etc. 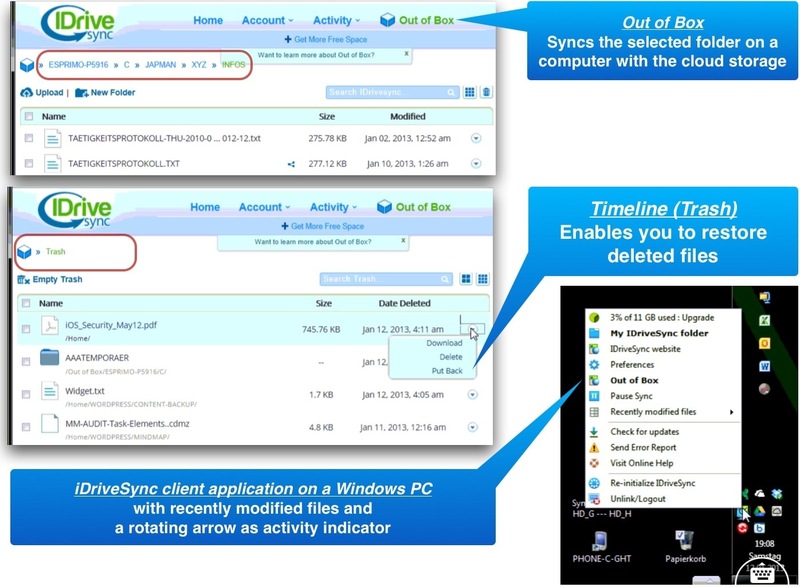 iDriveSync and Dropbox provide powerful apps for Mac/PC as well as iOS devices. A special functionality of Dropbox is the ‘Camera Upload’ which uploads every photo you made with your camera on an iOS device. Both providers do not support encryption in transit. If the provider is compromised your data will be unsafe. Except WUALA (CH) no provider fulfills the necessary requirements for safe transfer and storage. Admittedly cloud providers ensure encryption but the Terms and Conditions of nearly all providers authorize them to review the data or pass them to authorities on demand. Dropbox currently does not support WebDAV whereas iDrive does. That must not be a disadvantage because the PC-Clients support convenient syncing with local folders and most of the iOS-Tools (like USB Disk, GoodReader, Documents, …) support direct access to the storage of well-known providers. If using the iWork suite intensively Dropbox is not the best candidate as there is no support for WebDAV. If iCloud syncing for iWork is turned on (Settings – iCloud – Documents + Data) they are admittedly transferred to other iOS devices but only those using the same Apple ID. So sharing is only supported by mailing the document as an attachment. iDriveSync supports WebDAV and therefore can be configured in iWork using the ‘Copy to WebDAV’ feature. What you have to do is to enter the server address (http://dav.idrivesync.com), your credentials and to share the iDriveSync folder with your colleagues. Both iOS apps support the display of the above mentioned file types except CSV files. Another benefit of iDriveSync vs. Dropbox is the pricing (1.38 $ /50 GB/y vs. 3.75 $ /50 GB/y). So the overall winner is iDriveSync.